wendy house » Blog Archive » size of an alley! All the Cyclade islands were mazed with Alleys just the right size for a mule and its handler. Some towns even advertised themselves as not having cars. 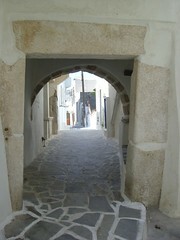 European cars are small but not small enough for these alleys! 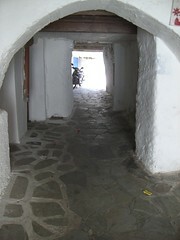 Occassionally buzzy-bee sounding mopeds would swish around these alleys. 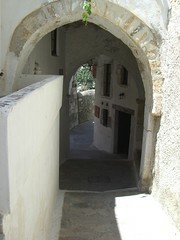 Houses were often built over the alleys creating pleasant shade and interesting archways. This scribble was published on Saturday, September 6th, 2008. You can follow any banter on this scribble with the RSS 2.0 feed. You can share your inspired musings after typing the anti spam word near the bottom of the page. But no Pinging because its too naughty.